Personalized Christmas Ornaments. Photo Christmas Ornaments. Decorating the Christmas tree is a favorite holiday tradition and this is a perfect opportunity to try something new and meaningful with personalized Christmas ornaments. Make your tree stand out by creating custom photo Christmas ornaments to hang from its branches and design your own ornaments. These Christmas ornaments are flatter and stronger than round personalized Christmas baubles, made from strong ceramic, and decorated with photos on both sides. Delivery time: 3-5 days, several options available. The best way to add memories to your Christmas tree is to incorporate personalized Christmas ornaments. Once you select snapshots from your most precious moments, you can upload then and preview them on these photo ornaments. Choose your shapes (e.g, classic round, heart-shaped, five-pointed star...) and design your own unique photo Christmas ornaments, online, right here. An optional cute pouch, makes these custom ornaments a sweet and useful gift in their own right, helped further by our generous quantity discounts. Have your printed ornaments delivered to your doorstep in time to hang them on your Christmas tree. The holiday season can be a tad chaotic and stressful when it comes to the art of gift giving. Whether it is two days before Christmas, or two weeks, Bags of Love is ready to help. Our high-quality full-color printing makes the custom photo Christmas ornaments look professional and stylish. Skip the stress this year, especially awkward gift exchanges, and design a couple of generic ornaments to keep as back up gifts too - our quantity discounts make this a perfect cost-effective solution. When it comes to the holiday season you can never be too prepared, so always get a few extra Personalized Christmas Ornaments. Stay ahead of the game while spreading Christmas cheer in your homes or the homes of your friends and loved ones with our Custom Printed Ornaments designed by you online. Note: Custom ornaments retain a white edge after printing. Please see gallery photos. The white ceramic is strong and handles well, from posting to storing in the Christmas decoration box year after year. You might notice that there is a slight color variation between the front and the back of your ornament. Please be assured that this is normal and is due to our specialist printing method. The quality of your design will not be compromised. Our personalized Christmas ornaments have fantastic high quality print all over the surface. Please note that the edges will remain white, with the image feathering out towards the outside edges. This is most apparent on dark photos or designs. See photo in our gallery - this by no means make the ornament look less attractive, because the soft feathered edge makes the ornament look even cooler. Please note that the edges of the personalized ornaments will remain white (most apparent on dark photos or designs), with the image feathering softly to the edge, blending very nicely with your personalized tree decorations. Your photo Christmas ornaments are finished with a beautiful red ribbon, which threads through a hole in the top center of the ceramic. Please remember to allow for this hole in your design (you will be able to see it on the design interface) otherwise you may lose important parts of your design. Create your own Christmas decorations with personalized Christmas ornaments and spread the true meaning of holiday spirit by giving photo ornaments to the ones you love. Your personalized tree ornament will help you to recall memories and can be reused for years to come. Design new photo Christmas ornaments each year and create an evolving set. Every personalized ornament perched on the Christmas has a story to tell. 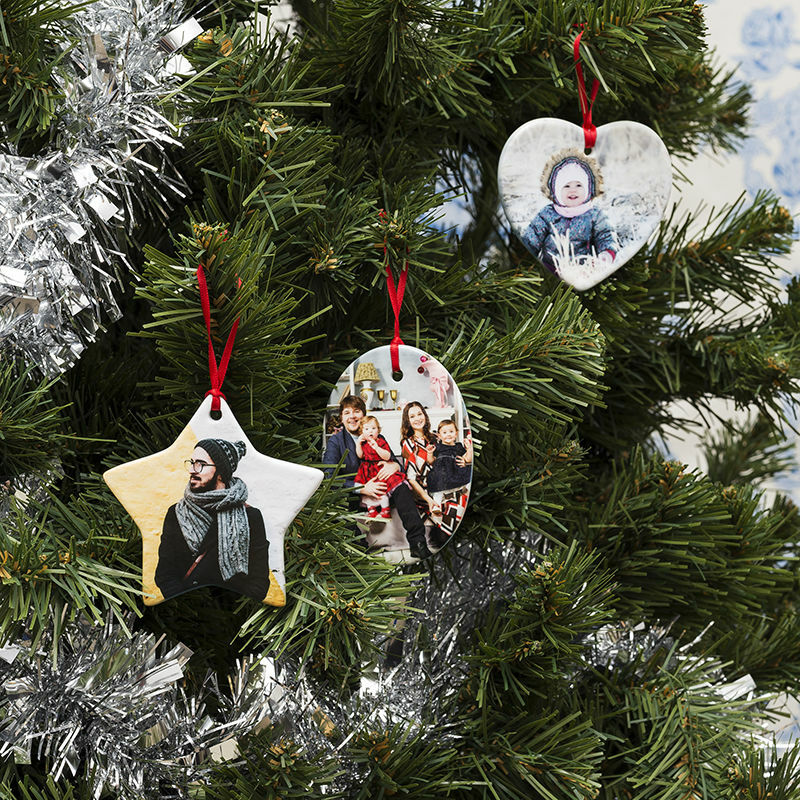 Personalized Christmas tree decorations with your photos will remind you of those times. NB: Ornaments retain a white edge after printing. Please see gallery photos. The white ceramic is strong and handles well, from posting to storing in the Christmas decoration box year after year. You might notice that there is a slight color variation between the front and the back of your ornament. Please be assured that this is normal and is due to our specialist printing method. The quality of your design will not be compromised. Personal Christmas stockings printed and sewn. Customize with your images and text, perfect for creating childhood memories. What better way to get in the Christmas spirit than with Santa Hats. Made from 100% polyester and available in 3 sizes.